I regret rebuilding my ej205 because it's a long, arduous, nerve wracking, frustrating, and expensive process. But I beefed it up, so it's not all bad. The biggest problem has been remembering how everything went. I started the motor in school, so I took it apart in august, and am just now putting it back together. CP pistons, sti rods, king bearings, cross drilled crank. About $1600 in the shortblock, on top of the initial cost of the complete engine, crossmember, sway bar, and harness ($1500), then the UEL header (ebay unit, got it for free) up-pipe (used $100) downpipe (cnt-$280) and catback ($250 used SRS) makes the total cost about $3,730. About the same price as the car. I just like to explain how and why I did things.....and it helps me keep track of how and why I did things. I've been following your thread for a long time....always a good read. The turbo'd ej22 set up is sweet....hopefully you get all the kinks worked out. That's the only thing about GC's I hate...the rust! My rear 1/4 panel rust actually just started this year.....I saw it starting to bubble up over the summer. At least it managed to hold off 14 years of northeast winters. Well like you said, its not all bad because you'll have a fresh engine.....definitely worth it in the end. If I can ever find a 91-94 turbo leggy at the junkyard...I'll take it's super awesome engine and rebuild the bottom end to have a spare block....and eventually do a 205/22t hybrid. How are you running an access port for your rs? Is it because its Wrx swapped? love what youre doing. FYI I removed my front and rear bumper beams on my old car. I bet i lost like 50lbs total. Its crazy how little metal is in those jdm ones. Yeah, the ecu and wiring allows the Accessport to hook right up as if it were a WRX. I've decided to just cut the front one when I get my new bumper...to have some protection up front....and maybe get a JDM one for the rear. Next weight reduction will be a catback....the oem wrx one is really heavy because of the muffler....so an aftermarket one should help me drop 10-15 lbs or so. Just don't know which one to go with yet. make a custom "cat-back". 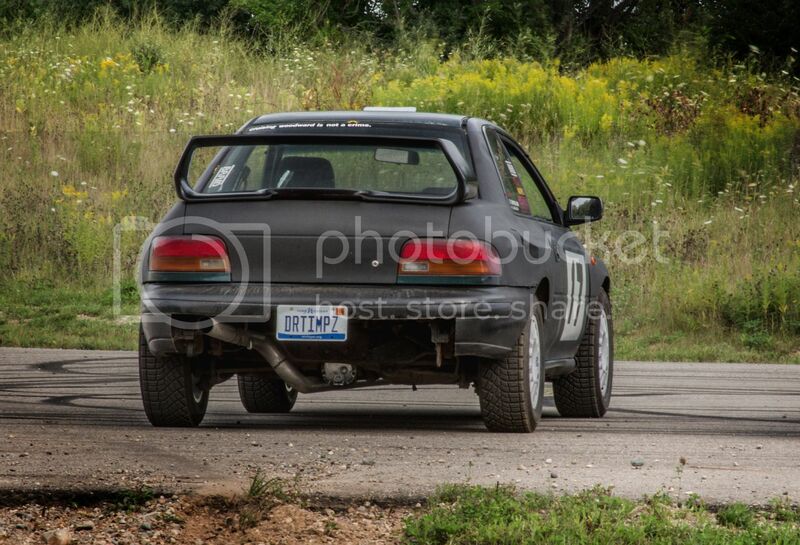 make it go above the hangers in the rear, then you can go straight through the bumper, it's rally amazing. Like mine! except, I might recomend a little more subtle cutting of the bumper. ps, yes i removed my spare tire well for a sheet of aluminum as well. ...I also want to keep a quiet exhaust, so my catback choice is pretty limited. I can't weld either, so that throws out making my own. Right now...it's basically a stock WRX exhaust system....the ONLY aftermarket part is the Cobb catted downpipe. It's just as quiet as the ej22 with stock exhaust was. Last edited by RavensFan77; 12-15-2014 at 06:25 AM..
Looks like a fun build man keep it up. Yeah, as long as I get every detail right. As for the ej22t, I have thought about that often. I would love to have a 22b replica. Car: We are Open Late7 Days a week! What a well executed build. Keep up the great work!